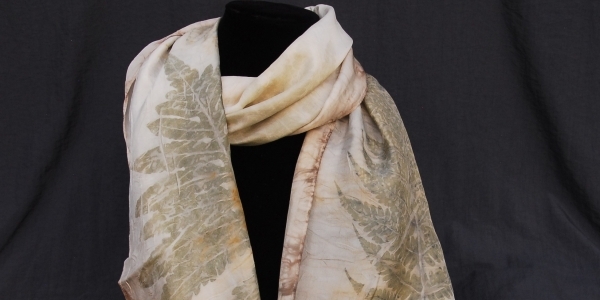 Create beautiful botanical prints and whimsical rust prints on fabric using local plants and found objects. Come and explore the processes of eco printing and rust dyeing as we create our own naturally printed samples and finished scarves. Discover the magic as each piece reveals its unique shapes and colors. Anne Stiebing is a fiber artist and educator holding a BFA and MAT (Masters of Arts in Teaching) from Maryland Institute College of Art. She has taught art for over 10 years in public schools, non-profits, and private organizations. Anne collaborates with her husband John Kelley, a jeweler and artist in his own right, using materials from the land. Anne specializes in working with found materials, and uses birch bark, wood, and vines in basketry and book making, as well as plant materials and found objects in paper making, natural dying, jewelry, and sculpture. She achieves visual harmony between materials and elements in her work, and a conceptual balance between materials and processes.